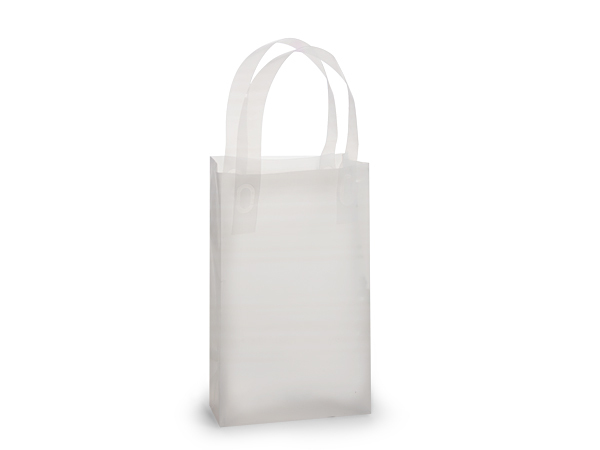 Rose sized plastic gift bags with soft loop handles are made from 3 mil frosted clear plastic. Bags measure 5x3x8" and are sold in a small pack of 25. Plastic Gift bags are made from 3 mil clear hi-density polyethylene. Bags have heavy cardboard inserts and sturdy 6 mil handles. 100% Recyclable. Available in Bulk cartons, small packs and an assortment. Variety of sizes to choose from. These bags are recylclable and reusable for great plastic gift bags. Great quality!